Looks like you are making good progress. I am having the same issue with body work as you did. The guy I bought my car from told me the floor had been replaced and all body work done. All they did was weld patches over the rust holes in the floor then cover it up with black goop. I'll probably end up cutting out most of the floor and replacing it now. I have a question for you guys. I have gotten all my gaps on my doors pretty close, but the middle seem is off by an 1/8" or less. I know i need to use the seem as a reference when i change the panel. Should i just fit the 1/4 to the same offset or should i fit it to the seem on the door. I can fudge the door so the seem is in line with the 1/4, but the gaps around the door get bad. Any input would be appreciated. Sorry, forgot to take pics. Will take some tonight. Need pics to make sure I understand what you are asking John, In this pic it looks like the door is pretty even but gap is a little too tight to the 1/4 as well as to the fender. Was this the original 1/4 on the car? If you had the door this close before taking off the 1/4 and hopefully you left the door on you should try to get it as close to how it was in this pic as possible. 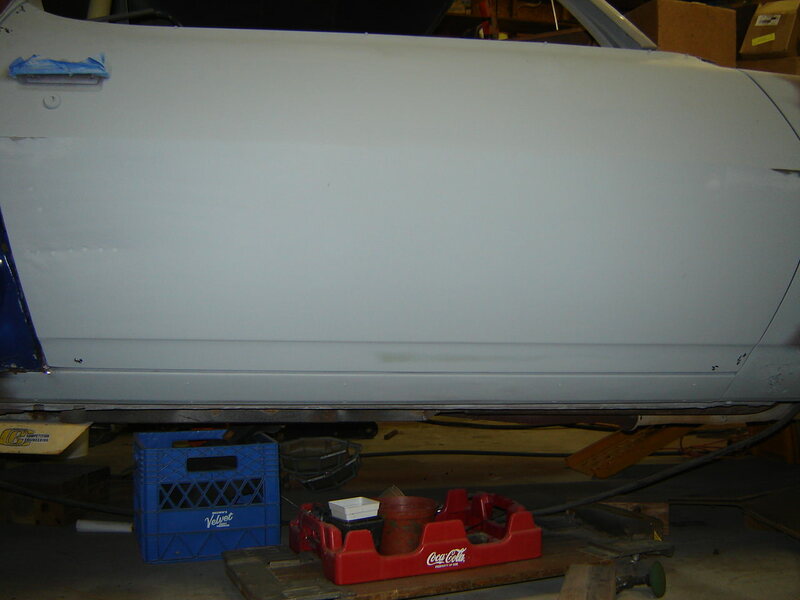 You can always move the whole door forward to get the 3/16 to 1/4 inch gap proper and the fender/door gap last. Post up some pic's of what you are working with so we can see to be of more assistance. You want to take your time and get this part exactly right, this is very important! I think i should of said body line. The one in the middle of the door. the door is about 1/8" or less lower than the panel. on both sides. all the gaps around the door are good. Just ordered the rh outer wheel housing from NPD. Lots cheaper than Classic Camaro. Should be here by next Tuesday. That works out great, going to take off Wed and following Mon after Thanksgiving. Hopefully, lots of Camaro time. Are you saying that the mid body line is off and the lower one is good? Just want to make sure I get it right. If that's right then IMO you have two options...You can move the 1/4 mid-line up on the 1/4 slightly at the back of the door gap rearward to the wheel opening with filler and use a tape line from the front fender behind the wheel opening to block it strait or if you can raise the door and lower the shorter lower line on the 1/4 down at the rocker (btw:this is much easier and in a less conspicuous location). I hope this makes since. BTW it is important that the bottom of the door is level across the rocker at the bottom. That's the first thing to line up is that and the mid-line. the door to 1/4 gap should only need to be a forward or back adjustment for gap or a top or bottom roll in or out to match curves above/below the mid-line. The bottom gap between the door and rocker is pretty good. that's why i didn't want to adjust the door higher. I think I already have a 1/4" + gap all the way down the bottom of the door. I will look at it tonight. I also wrote the gap sizes on the door for references last night. I will take some pics and post tonight or tomorrow morning. Check back then. I will try to make myself clearer. The gaps around the ps door are acceptable. You can see that in the picture. I have a 3/16 even gap down the ps side door. 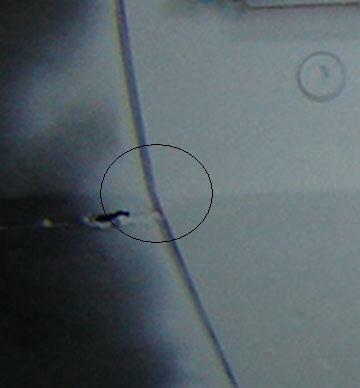 the door to fender has a 1/4" gap from top to body line and 3/16" from there to the bottom. the bottom gap on the door to rocker has a 5/16-1/4 even gap all the way down. the driver side door needs to be adjusted as i see discrepencies. I changed to door hinge on that side. I tried to adjust the door and i got the same results. the driver side door needs to come up about an 1/8" at the quarter panel side. this would even out the gaps around the door. 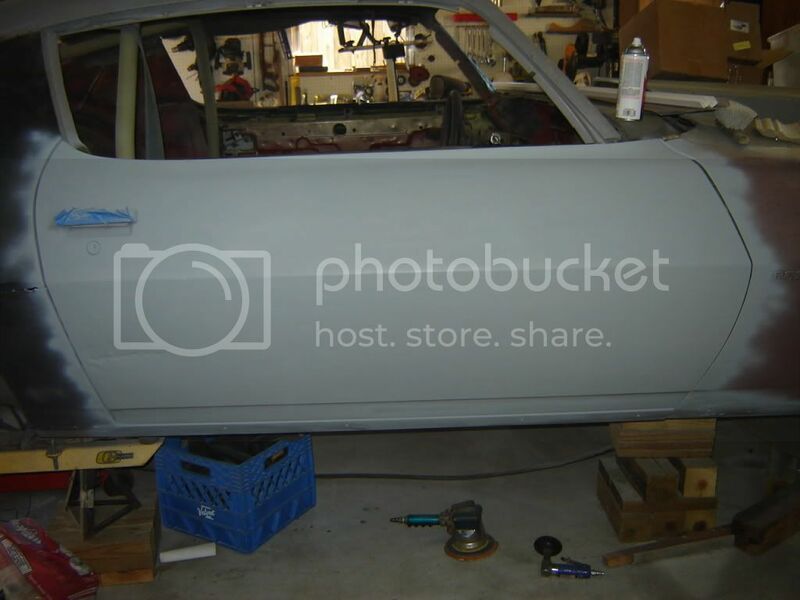 As you can see from the last photo, the ps door is about an 1/8" lower than the quarter panel. Again...is the 1/4 original at the mid line? Must know this first. In this pic the lower fender needs an 1/8 inch shim or so and also the bottom of fender needs to mve toward the front of the car. Also the upper fender is too low and needs shims under the top cowl bolt. BUT...the rear gaps at the 1/4 have to be set first! Again. either the 1/4 needs to be trimed at the bottom to lower the 1/4 mid line, or the door will need to be raised or the line on the 1/4 wil have to be moved up using filler and build primer. 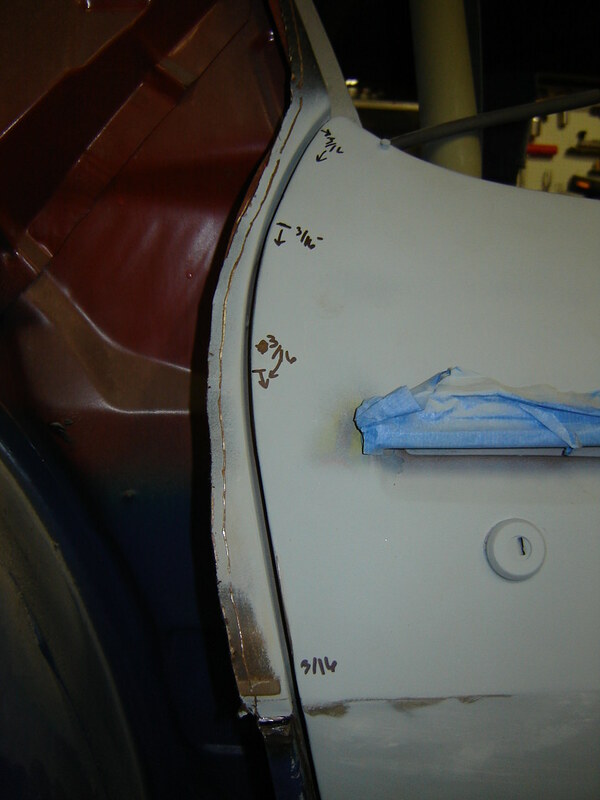 Get the back done first with the lower door to rocker as even as possible then you make the fender to door gap adjustments. It is critical that the door hinges bushings and pins be in good condition and the door to rocker and 1/4 be properly adjusted prior to removing any parts of the 1/4. Otherwise you have no reference point to go back to. I hope this makes since to you man. I will tell you that I have struggled with this myself and you will have to find an acceptable compromise to give and take a little here and there to get it close. It will never be perfect and it never was from the assembly line either. 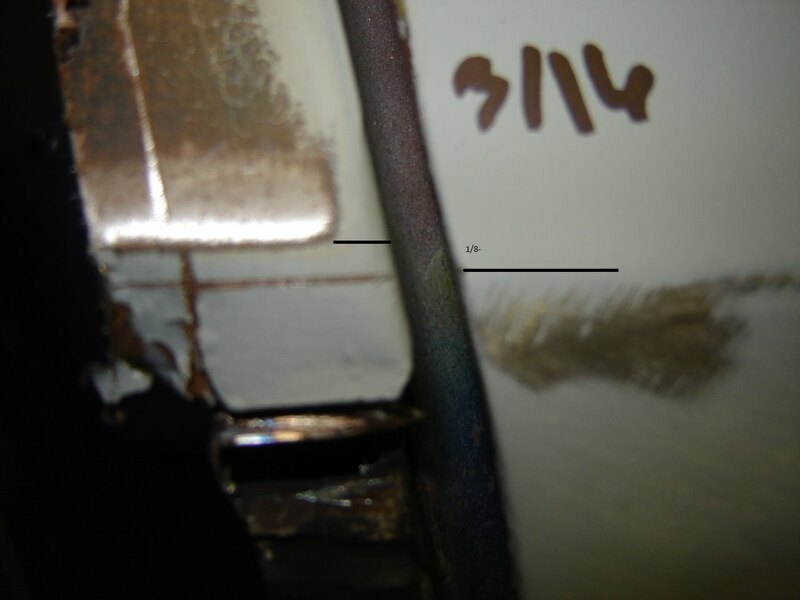 There is a good tread on lining up panels on autobody101.com. I would do a search there and read it as I think it will help you a lot. If you get out of sequence or don't have things done in the right order it can cause nightmares. Especially when you bring repop non GM parts into the picture...and sometimes even all GM parts can be difficult. 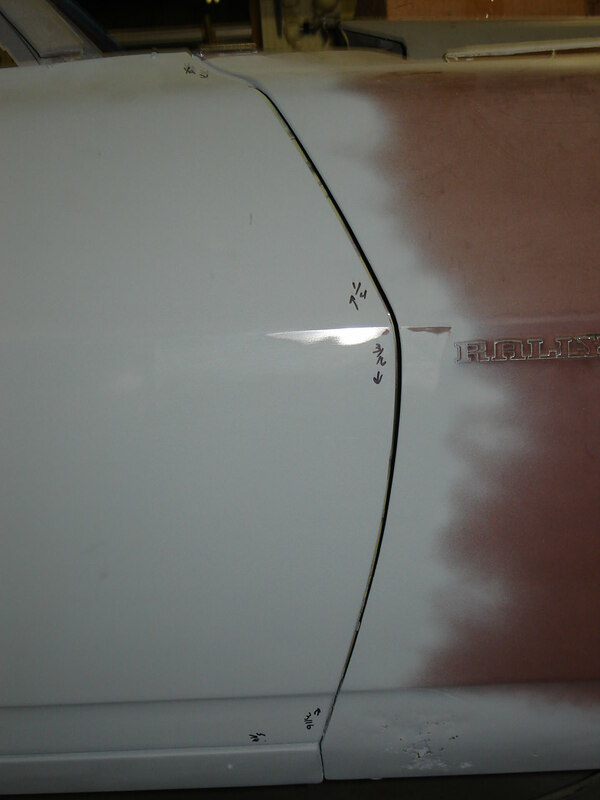 My door to rocker is a 32nd or a little more gap to the rear of the car to get a happy medium as I did not want to move the 1/4 mid line up. I don't think it will be noticeable, but the mid line and lower grove will stand out...the mid line needs to be dead nuts on and the lower line within a 32nd to 16th or you will be able to see it. For me getting the doors in an acceptable alignment was the hardest part of all of the sheet metal work....it has adjustments in so many directions that it is almost an art to get it good enough! I bet I spent the better part of two whole days on this alone and I have to do it again. :-( all the rest is not to bad once this is done. Good luck and ask questions if you need to...this is not an easy task I assure you of that. But with paitience it is possible!!! Everything on the car is original. The ps side of the car was wrecked before I got it. But onto the question. The door to rocker is about perfect. I have a 5/16 even gap all the way down. I already cut the lower part of the 1/4 off next to the door, so I have nothing to go by below the body line. The measurements above the body line on the door to 1/4 is a consistent 3/16. The only thing on the passenger side is the body line and that to me is the most important. I never changed the hinge pins on that side because the door didn't sage and worked great. I did have to change the other side because the door hung down over a 1/2". The driver’s door will need more adjusting, I can see that. Tried to do it last weekend by myself and it seemed to not move. Maybe this is a task for 2 people. I guess I will have to decide if I want to move the ¼ down to meet the door. I think that will probably be the best bet. The door seems to be where I want it. The driver side is another post all together. I will worry about the fenders after the 1/4's change out. I will try to use all the original sheetmetal. the only exception might be to reskin the passenger door. i will try to fix the dent on the door by the 1/4. Thanks for your input and any more suggestions.